Great weight, consistent off tee, I have offset and it eliminated my slice. Irons shafts pulled to my right as a lefty I had hard time getting consistent dispersion. I love the cobra gravity back it has lots of power with speed for and old club its my best driver that I ever owned. As a newbie to the game, I believed that my swing had more to do with poor distance that I was getting with my first driver. However, I eventually worked that out, and got my hands on a gravity back driver ~10.5 degrees. I found the club very light, and with the regular shaft, it suited my slower swing speed. I am hitting it further, and the ease of use makes it a stayer in the bag. Would recommend this as a new golfer's first good driver, as the price is low with the 2 newer models and the quality is excellent. Very dissapointed!If you realy like this driver it is critical to fit it with a proper shaft,as i lost 30 meters on distance with the original fitted shaft.Good control on low swing speeds +/- 90mph,but if you want to crack a par 5,make sure you have a good caddy,or a cheap ball.Overall a good looking driver and very comfortable.I would rather stick with the previous model king cobra(straightest and longest club in my bag) The price is also too high,because you have to fit other shaft. Absolutely the best driver i have it. It has taken away my slice almost completely and now driving the ball on average 285-290 yds. Becasue of the driver i have broken the 90 barrier but still average low 90's. I can't help but say, anyone with a slice who wants distance,BUY this club! I am very pleased with the results I am achieving with the 8.5 degree loft club. More accurate and the control is great. My drives have increased 20 to 30 yards. I am exceeding 280 at times. Thanks for a great club. I got this cheap on ebay. It was ok for the price. I didnt get any more distance than old driver. This club is way too light. This club would be great for a senior. The stock shafts are also crap. I brought it into a golf shop and they gave me $80 for as a trade in which I used towards a 975d with a grafalloy prolite. That was a great move because I made $10 and got a way better driver. I purchased the Cobra Gravity Back Bi-Metal Offset, 10.5 degree with "Regular" flex graphite shaft. I switched from an orginal Callaway Steelhead 9.5 degree "Stiff". I hoped to find a driver with as much control for me as the Callaway but more distance. I certainly found the control plus some. Although I wasn't having problems with the Callaway, the Cobra is noticeably easier for me to control off the tee, regardless of my swing speed. And with the offset, you can cut loose on it without worrying about the occassional slice. Where I gained control, I lost distance. In fact, I believe I have lost 15-25 yds on average with the Cobra. With the Callaway, I averaged 270 to 290 when hit correctly with a controlled but firm swing. Now, I'm getting about 245 to 270 on average with the same swing. I'm convinced that most of the difference is due to the 10.5 degree loft with the Cobra as compared to the 9.5 Callaway. When driving the Cobra, at impact it feels as solid and satisfying as all the new drivers I tried (Callaway VFT, Taylor Made SuperSteel, Ping TSi, Mizuno Blue Rage). Immediately after impact, the ball looks and sounds like a scud launch. The problem is that it just keeps going up and, when it lands, there is zero roll. Again, I get anywhere from about 245 to 265 in the air with little to no roll. Playing from the White Tees, I can live with the distance. But playing from the tips really pushes this club. For instance, on a 410 yd par 4 from the whites, this club is perfect. Your laying there with a comfortable feeling 7 or 8 iron, 145 - 155 yd "scoring zone" shot to the green. However, that same hole becomes a 430 yarder from the tips, and that same drive becomes a 165 - 175 yard 5 or 6 iron shot, just outside the scoring zone. Because I love the control and forgiveness with this club, I am searching for the same club with a "stiff" shaft and either an 8.5 or 9.5 loft. I think this will solve the distance issue. I highly recommend this club for the mid-handicapper (like myself). 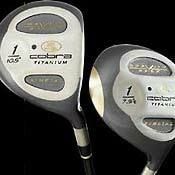 I've hit many drivers lately, especially the new "super-sized" heads. I cannot get used to setting up with such a large club-head. Although a little larger than my old Steelhead, the Cobra feels and looks very comfortable at address.